It looks like any other portable charger for a smartphone or tablet, but the innocent-looking JumPack doesn’t just provide emergency juice for browsing, music and calls. It saves the day after an emergency breakdown, too. While we’re always on the look-out for gadgets that perform to tasks – and therefore save on luggage – it’s never crossed our mind to go looking for something like the JumPack, but it makes a lot of sense. Inside the device is a 7,500mAh battery, which is enough to refuel an iPad Mini from empty, and an iPhone 5S about thrice over. 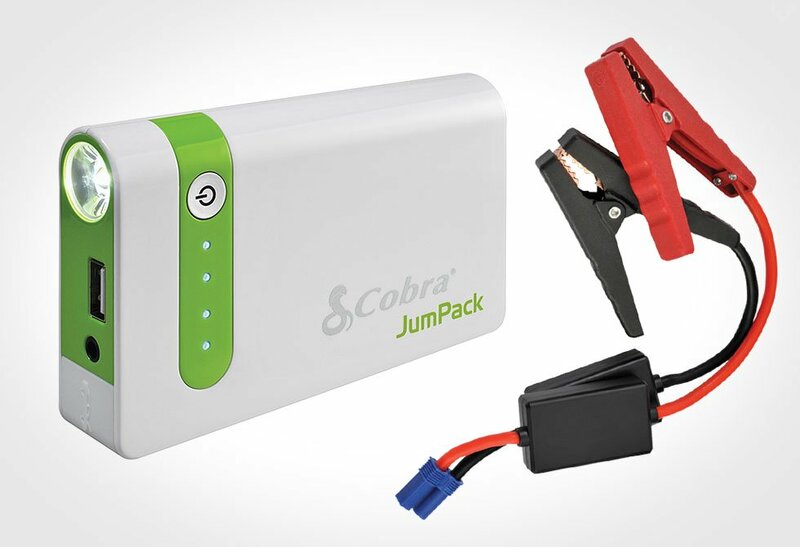 Better known for making dash cams and radar detectors for drivers in the US, Cobra Electronics’ debut in the portable battery market is nothing if not unique. Jump-start power packs can be pretty large, but no this one; i’s about the size of a pack of cards, and weighs just 300g, so it’s hardly a pain to travel with. Would we carry it round the world if we were planning on renting a car? Absolutely, and though you’d probably never use it for jump-starting a car, it’s bound to get a lot of use for its primary function – to refuel your phone. In our test it took three hours to fill with power from a DC outlet via a microUSB slot, while power is pumped into a mobile device via a 2.1-amp USB output. That 2.1-amp rating is crucial since it means that it can cope with tablets as well as phone. As a nice bonus, it refuels a phone super-fast – about 2% per minute in our test, which is twice as fast as most portable chargers purely for phones. Can it revive a dead car? Absolutely. It ships with all jumper cables and a 12V cigarette lighter charger to keep the thing refuelled. It’s capable of outputting a current of 400-amps, which proved enough in our test, and with the JumPack’s positive and negative clips in place under the hood, it did the job. What’s more, it’s not just for cars; travellers using anything from motorbikes to boats or snow mobiles can use the JumPack. Has Cobra thought of everything? Well, actually, it has; as well as power for phones and cars, the JumPack also sports a LED-powered torch/flashlight that has a few different modes SOS and strobe, as well as a basic lamp mode. If that’s a nice extra, this three-in-one device is attractive for travel for two reasons; it’s a fast, reliable and high capacity battery for phones and tablets, and it’s just so small. However, for a device that’s likely to left in a car for long periods, the final reckoning will be down to how long the JumPack can retain its charge. A flat battery for a flat battery isn’t going to impress us … we’ll get back to you on that one. For now, it gets a place in the glove compartment.